, an English critic and poet, was the son of Joseph Walsh of Abberley in Worcestershire, esq. and born about 1663, for the precise time does not appear. According to Pope, his birth happened in 1659; but Wood places it four years later. He became a gentleman-commoner of Wadham-college in Oxford in 1678, but left the university without a degree, and pursued his studies in London and at home. That he studied, in whatever place, is apparent from the effect; for he became, in Dryden’s opinion, “the best critic in the nation.” He was not, however, merely a critic or a scholar. He was likewise a man of fashion, and, as Dennis remarks, ostentatiously splendid in his dress. He was likewise a member of parliament and a courtier, knight of the shire for his native county in several parliaments, in another the re* presentative of Richmond in Yorkshire, and gentleman of the horse to queen Anne under the duke of Somerset. 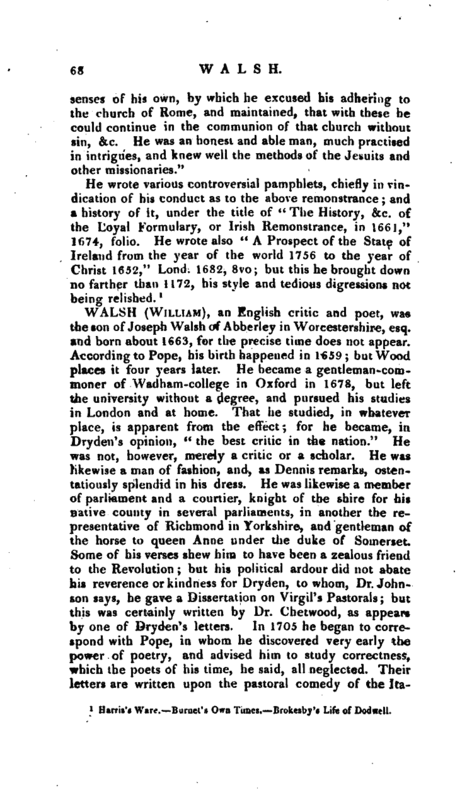 Some of his verses shew him to have been a zealous friend to the Revolution; but his political ardour did not abate his reverence or kindness for Dryden, to whom, Dr. Johnson says, he gave a Dissertation on Virgil’s Pastorals; but this was certainly written by Dr. Chetwood, as appears by one of Drydeu’s letters. In 1705 he began to correspond with Pope, in whom he discovered very early the power of poetry, and advised him to study correctness, which the poets of his time, he said, all neglected. Their letters are written upon the pastoral comedy of the | Italians, and those pastorals which Pope was then preparing to publish. The kindnesses which are first experienced are seldom forgotten. 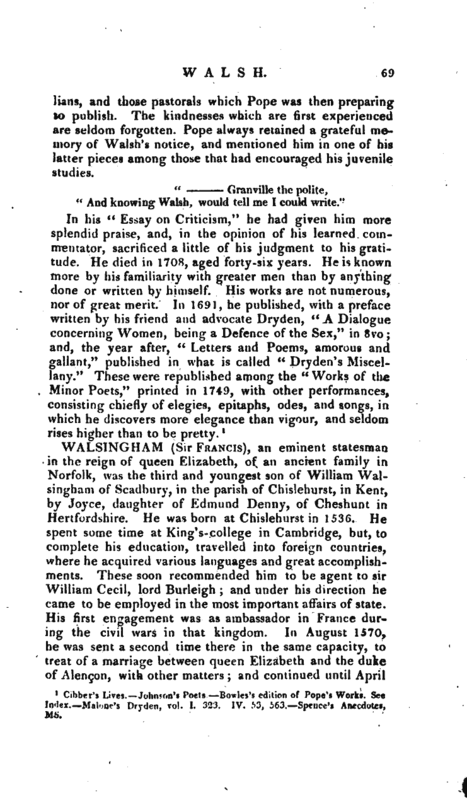 Pope always retained a grateful memory of Walsh’s notice, and mentioned him in one of his latter pieces among those that had encouraged his juvenile studies. 1 Cibber’s Lives. Johnson’s Poets. Bowles’s edition of Pope’s Works. Sec Index. Malone’s Dryden, vol. I. 323. IV. 53, 563. Spenc’s Anecdotes, ms.